Living in New York, one has the great fortune of never being very far from places where giants once walked the earth. 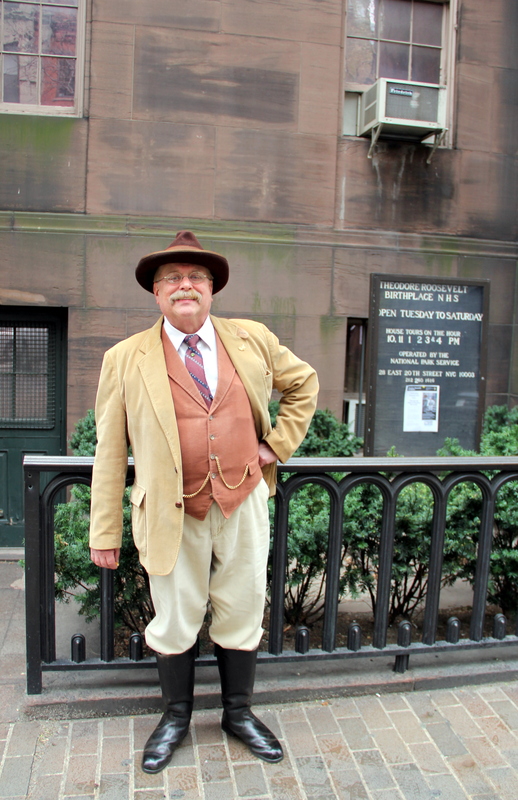 One of these giants is Theodore Roosevelt, born and raised in the city. Today, there is a prevalent feeling that US society is at a crossroads. Therefore, it is perhaps fitting to revisit the sites of a man who undoubtedly was one of the key players that gave birth to the self-identity of the modern US as a nation. Theodore Roosevelt the man doesn’t need much of an introduction. In recent years, we had the great misfortune that our leaders were – at best – either smart or strong, but never both. Things were different back then; Theodore Roosevelt can be legitimately called both strong and smart. Basically a scientist and scholar who ended up in politics – given his early publications on ornithology and the war of 1812, it was assumed he would just go for a faculty position in history or natural philosophy. Luckily, he never quite lost this streak – his writings are as eloquent as they are witty. For instance, as late as 1913, he invokes the “Brothers of the cosine” in a discussion of a modern art exhibit. His achievements are legion, the stuff of lore – he is the only person to ever jointly earn a Medal of Honor as well as a Nobel Peace prize. At San Juan Hill, he personally banished the Spaniard from the New World, after over 400 years of oppressive colonialism (with hindsight from the 21st century, this doesn’t seem much of a big deal, but the small US army was in such disarray in 1898 that the smart money of the time was overwhelmingly expecting a Spanish victory). As undersecretary of the Navy, he established the conditions that ensured Dewey’s victory in the Battle of Manila Bay (perhaps the most decisive naval engagement of all time; the US suffered a single fatality due to heatstroke, while all Spanish units were sunk). He is responsible for the creation of the Panama Canal as well as the Republic of Panama itself. 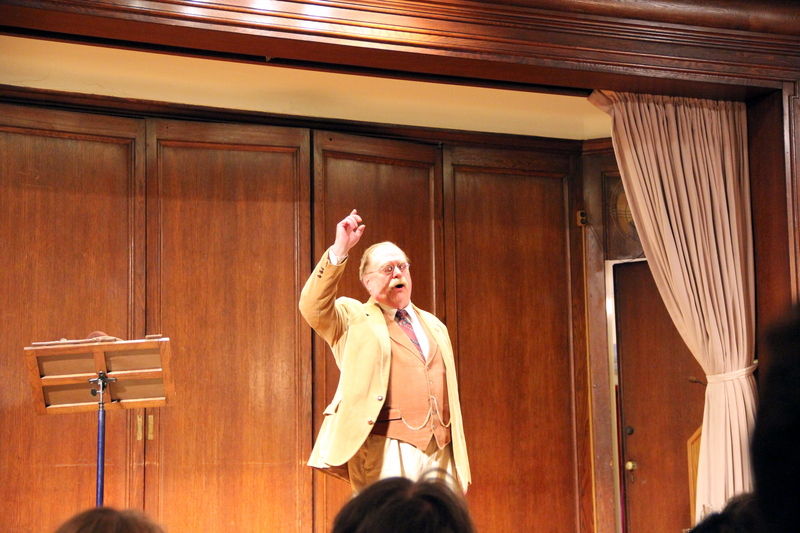 He personally discovered the River Roosevelt (formerly the River of Doubt). He is responsible for establishing most of the national parks that we enjoy to this day and founded the Bull Moose Party. Along with many, many other exploits. For a comprehensive rendering of his life, I recommend the excellent three volume biography by Edmund Morris. While most people are focused on his achievements as president, I don’t think he himself would consider this as most significant – he did great things before and after the presidency. More importantly, he is someone with an incredible personal philosophy who became president pretty much accidentally. Also, most people focus too much attention on him as a person, some making the mistake of idolatry, something that Theodore Roosevelt himself would abhor. This is understandable. 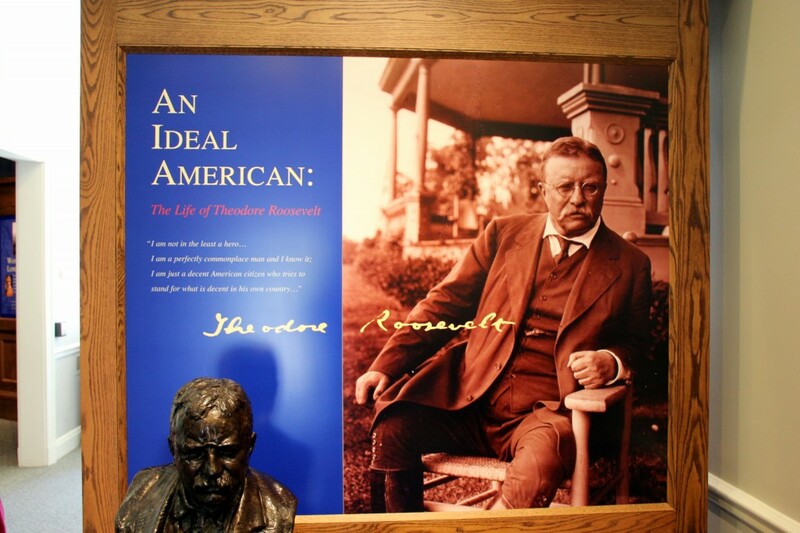 There is much to admire in Theodore Roosevelt. Besides personal bravery, he championed women’s suffrage and was the first president to invite a black man for dinner at the white house – that might not seem like much today, but at the time, newspapers chided him for “committing the most damnable outrage ever perpetrated by any citizen of the United States” and he lost the South forever. But he was not without fault, even made grave and unforced mistakes, for instance designating the disastrous Taft as his successor or his actions in the Brownsville affair. Others make the mistake of attacking a caricature. In fact, most people terribly misunderstand the historical Theodore Roosevelt. For instance, contrary to popular belief, he was not a warmonger. The point of the big stick is precisely that having it will make it much less likely that one will have to use it. The history of the last 100 years amply confirms the wisdom of this idea. Regardless, fascinating as he might have been, neither Theodore Roosevelt himself, nor his presidency are of primary interest per se. His personal philosophy however is something to revisit in these times of need. While a comprehensive treatment of this philosophy will have to wait for another day, we do have space to address one of its cornerstones, one that stands very much in the intellectual tradition of Alexander Hamilton. Front and center is the notion that the point of life is not to be as comfortable as possible; rather, the point is to welcome challenges, meeting them and overcoming them. Thus, they can be used for progressive and positive self-transformation. In short, the goal is to live the strenuous life, not one that is shirking away from the effort necessary to do one’s duty. There are no excuses. Roosevelt himself was troubled by asthma and bad eyesight (in an era where that was definitely not ok, at least out west). Instead of whining and complaining, the point is to focus one’s attention on things that one can control, changing them for the better by effort and action. This effort must not necessarily be selfish and just be exerted for the personal good. On the contrary, it is important that these efforts are dedicated to the spirit of public service, propelling the society at large forward. His tremendous achievements are merely a byproduct of this practical philosophy. As you can see, this attitude is in critically short supply in the modern US. It is obvious that we as a nation and society need a restoration of this philosophy or face the consequences. 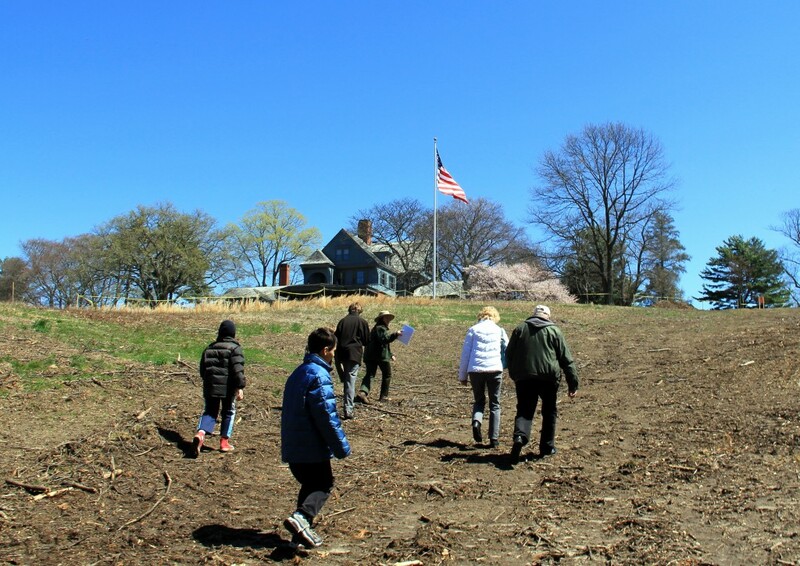 For inspiration, we will now revisit some of the sites of Theodore Roosevelt’s life as I found them on April 16th and April 17th of 2011. Some of these have been kept in the original state, others have been restored and can visited today, others have changed considerably in the past century. This New York Times article from 1905 gives an idea of just how much. 1. Theodore Roosevelt’s birthplace at 28 East 20th Street. 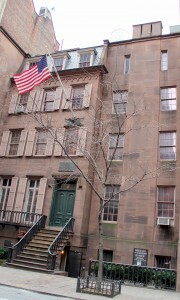 Theodore Roosevelt's birthplace at 28e 20th Street. TR was born here on October 27, 1858 and lived in this house until 1873, when he was 15 years old. Today, this is a National Historic Site, managed by the National Park Service. The inside is a museum, which can be toured. There are tours guided by actual park rangers that start once an hour. Very exciting. Still giving a rousing speech. Inside the birthplace. James Foote as TR. 2. 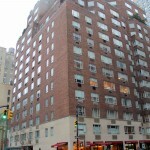 The house his father built at 6 West 57th Street. Given what transpired here, some said that there was curse on this house. It was in this house that his father died at a young age while TR was in college. It was also in this house that both his wife Alice and his mother passed away on the same day, February 14th, 1884. Highly pregnant, Alice had moved in with his mother while he was away in Albany as a New York State congressman. The Valentine’s day deaths might not have been altogether uncorrelated, as a terribly dense fog that lasted for over a week had descended upon the city around that time, compromising health and well-being of everyone present. As you can see, TR was no stranger to tragedy. 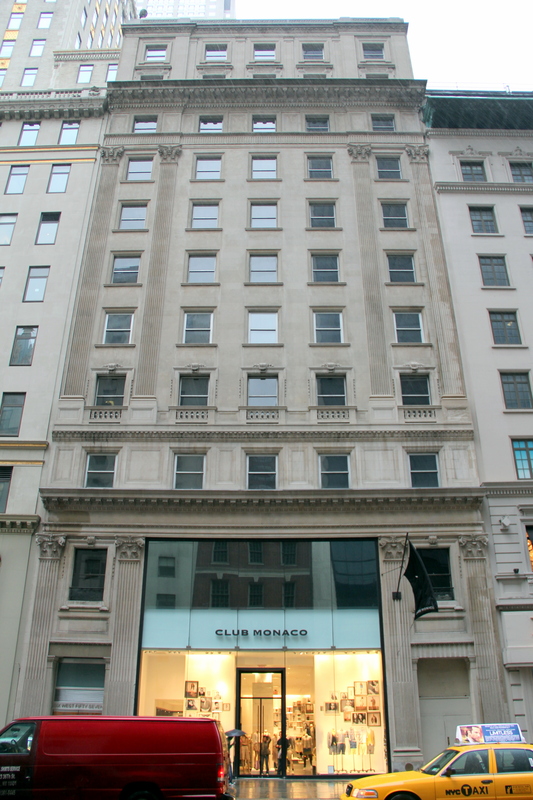 Today, this building seems to house a Club Monaco on the bottom floor whereas the top floors appear somewhat residential. 3. 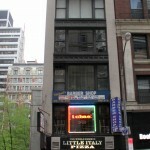 The small house he inhabited with his young wife at 55 West 45th Street. 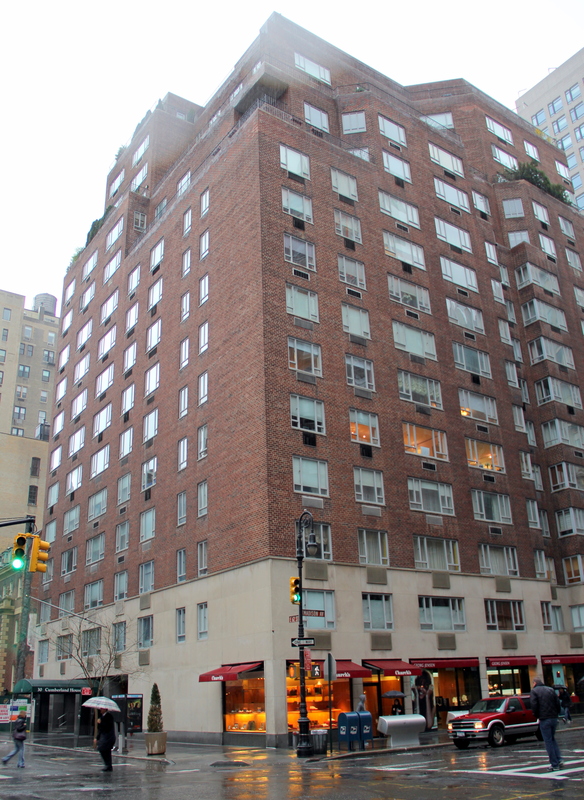 55 West 45th Street today. Definitely commercial. After TR got married, he moved here with his young wife, albeit only very briefly, as the wife died shortly afterwards during childbirth, as noted above. TR mostly spent the weekends here, as he was preoccupied as a minority leader in the Assembly in Albany during the week. In the meantime, Alice tried to start her own household here. Today, this building houses a Pizzeria, a barber, a software development company, a realtor as well as some others. Still seems quaint, but probably not the same house. 4. 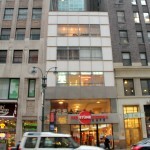 The house he maintained in New York at 422 Madison Avenue. 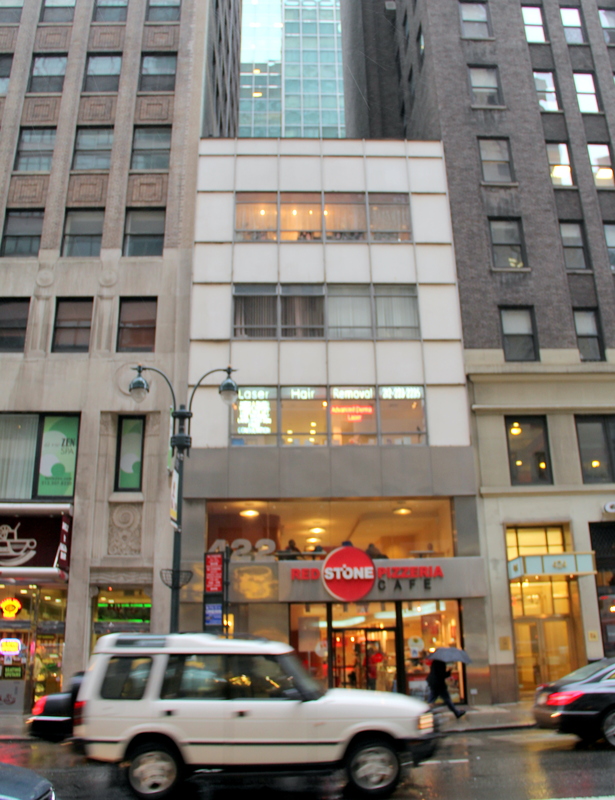 422 Madison Avenue. Looks much changed today. Most of the time while TR maintained this residence – from 1884 to 1886, he was actually away at his ranch in what is now North Dakota, rebuilding himself after the double tragedy with wife and mother. For a while, this was the residence of his sister Bamie who had moved in to take care of his baby Alice Lee while he was away in the Dakotas. These stays were quite extensive and lasted months on end. While managing his ranch out west, he squared off with local bullies and arrested several boat thieves while reading Tolstoy. Today, it seems to house a spa, a laser hair removal and skin care place and a Pizzeria. 5. The house he maintained at 689 Madison Avenue. 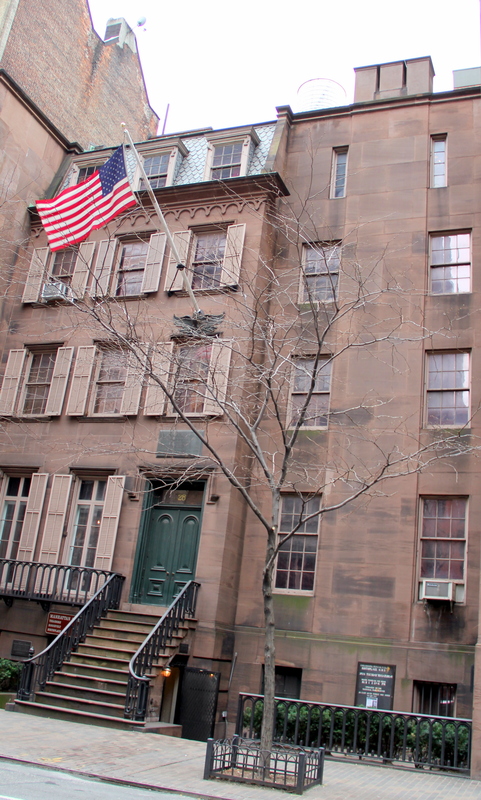 Technically, this was the house of his sister Bamie, but TR lived in this house as civil service and police commissioner of New York City, along with his second wife Edith and a growing number of children. It would later play a pivotal role in his campaign for Governor of New York, as the Governor was required to maintain a 5 year continuous residency in the state prior to election. TR however lived in Washington at that time, being busy as Assistant Secretary of the Navy. Utilizing some legalistic footwork, Roosevelt was able to establish that this place had been his legal residence in the years in question and was able to secure the governorship. Built by TR himself, this house has aptly been named the “Summer White house” and is also the place where TR spent most of his post-presidential years (when not away on Safari). 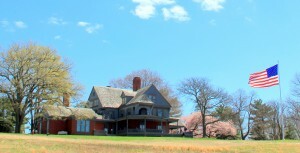 This is also a National Historic site, administered by the National Parks service. There are guided tours every hour on the hour, but photography inside the building is no longer permitted. 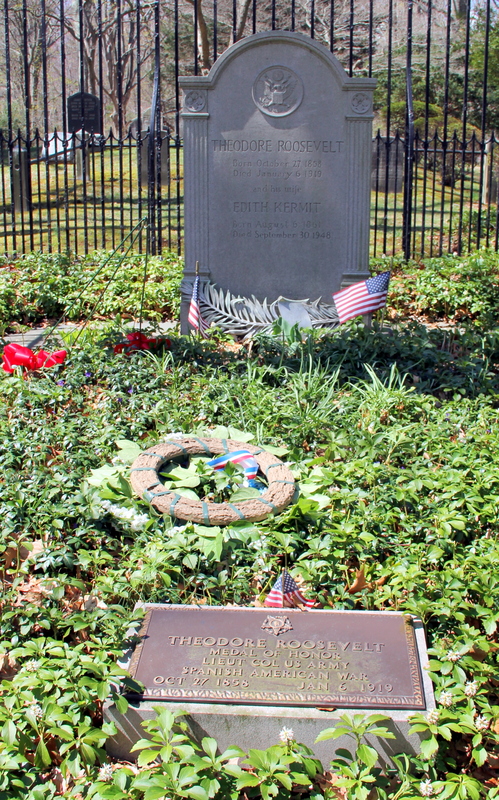 Appropriately, the gravesite of Theodore Roosevelt is close to the Theodore Roosevelt Nature Sanctuary, which is also the first national Audubon Sanctuary. 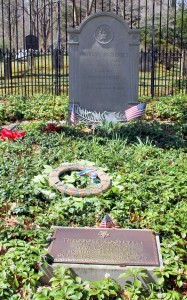 The gravesite is part of the Youngs memorial cemetery. As you can see, he lies here with his second wife and childhood friend Edith. This entry was posted in Life, Misc, Philosophy, Social commentary. Bookmark the permalink. Thank you for the wonderful article and collection of photos. As a TR fan and self-professed history geek, I found everything to be very interesting. Your efforts were much appreciated. TR is one of my all time favorites, right up there with Reagan. As a Navy veteran I appreciate his affinity for the Navy and the support he gave it. Thanks for showing us some of the homes he kept in New York. Thanks for your research on this. Helps in my research. You rock. Perhaps housed within NYC’s property valuation department (or their WPA records) there might be older photos that were made of the home sites made for taxation purposes or as part of FDR Works Program projects, which would be exciting to see from a research point of view for historians. Those photos might show the configuration of the windows or doorways which would be closer to the original 1870s facades. Thank you very much for the great work on the informational site. Wish we had a few more Americans in the mold of TR today.